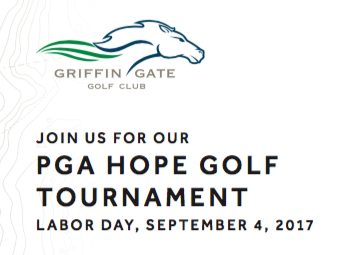 Join us Monday September 4 for the PGA Hope Golf Tournament here at Griffin Gate Golf Club. $125 per person includes a $50 donation to PGA HOPE, an 18 hole round on our Rees Jones championship course, continental breakfast and buffet lunch at Lexington's finest resort club. Prizes awarded for longest drive, closest to the pin, accurate drive, and hole in one! Space is limited with registration and payment deadline on September 1, 2017. Sponsorship opportunities also available. Explore the PGA Hope Golf Tournament silent auction item list (bidding September 1 at 1pm through tournament close). Download the PGA Hope Golf Tournament flyer below and help us support this amazing organization that provides much needed, no-cost services for our military veterans.